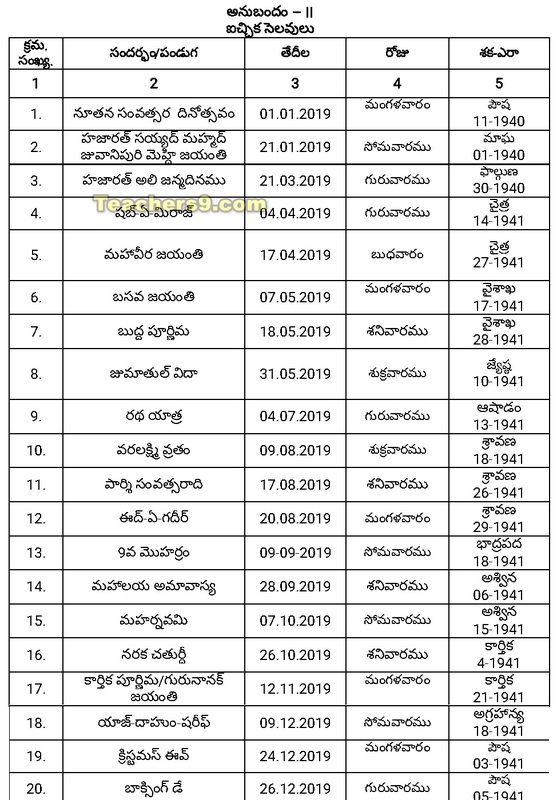 The Government of Andhra Pradesh directs that the days specified in Annexure I shall be observed as General Holidays by all the State Government Offices excluding the holidays falling on Sundays shown in Annexure-I (A) and Optional Holidays shown in Annexure-II except the Optional Holidays falling on Sundays shown in Annexure-II(A) during the year 2019. FIVE during the year 2019 on festival/occasions specified in Annexure-II to this order, at their option and irrespective of the religion to which the festival pertains. Permission to avail any of these holidays shall be applied for, in writing in advance and shall normally be granted by the Superior Officers competent to grant casual leave except when the presence of an individual employee is considered necessary in exigencies of Government work.